When Cory and I were first married we were young and trying to find our way in this life. We were not sure what to do for careers but we knew that we needed to go to college. Being young and having to support ourselves in school we did what we thought was best: we joined the Air Force. We did this for two reasons: school and to travel. Well Cory got to travel…LOL He was gone for 2 of the 4 years while I got to see Texas. He did get his education after we full-filled our commitment. We were so grateful for our time spent in the military and that he was able to serve our country. He was in the Gulf War for 9 months. During our time in the military we met lots of wonderful families and friends. One of the couples we became friends with, had just returned from Japan. This young man returned with his Japanese wife to a foreign country and she spoke very little English. We immediately became friends because my husband speaks Japanese. 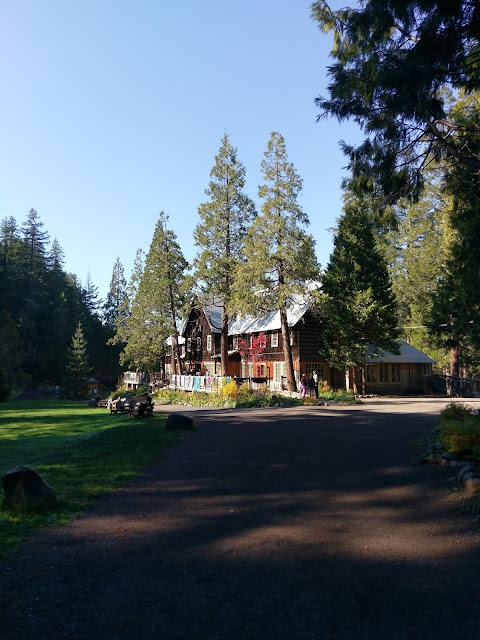 He lived there as a child and served a mission there for two years. When we first met, you could see the loneliness in her eyes and when Cory greeted her in Japanese she immediately got this beautiful smile….she found some friends. Of course, I do not speak Japanese, outside of the few phrases I have learned through the years. Our two families spent a lot of time together. In the course of our friendship we cooked together. It was something that we both loved to do and also something that did not require us to know the others language. I could watch and learn and I did. 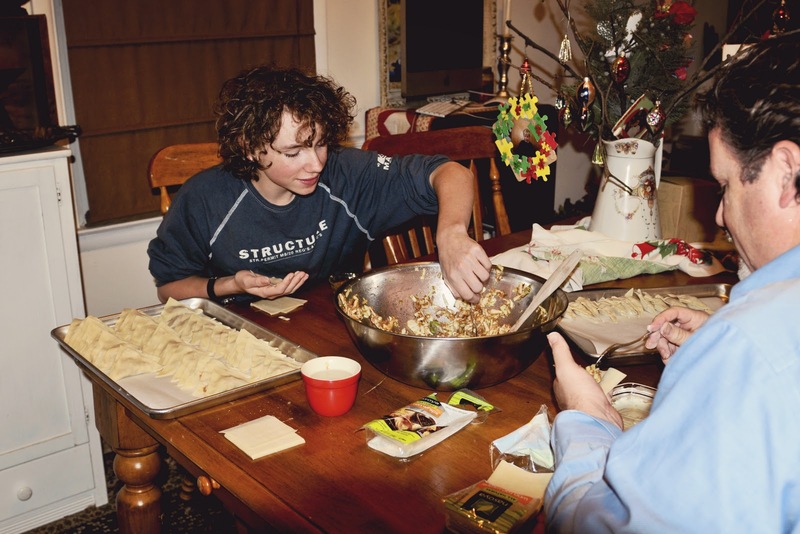 When she showed us how to make the gyozas…we were in love. Cory was taken back to his time in Japan…the smells were delicious in the air. He said he could close his eyes and feel as though he was in a home in Japan. This was a special moment for him. 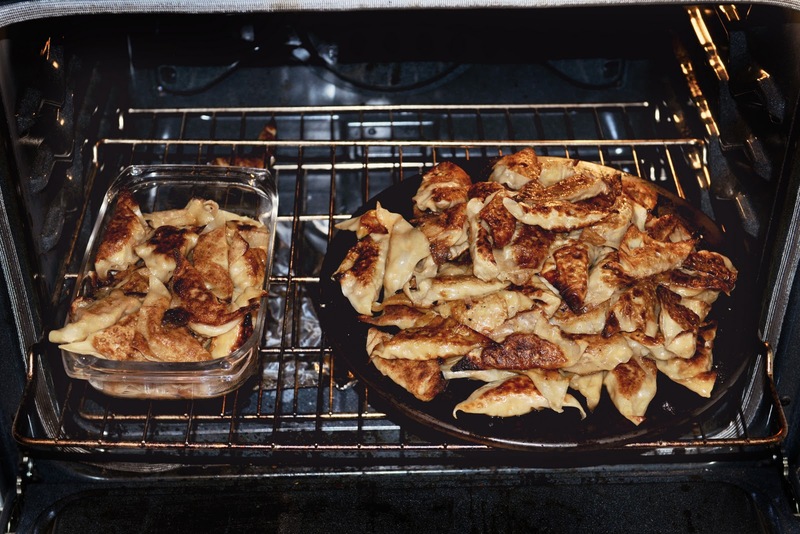 I could not believe how much work it was to make the gyoza's and together we knocked them out quite fast. From that short friendship and moment in our life, this recipe has been made thousands of times. In 25 years I make this recipe at least 4 or 5 times a year and each time I make the recipe I prepare about 200-250, unless I am hosting a party and then the number turns into 400-500. Yes, it's crazy but the smile on my guest faces when they taste them…it's worth it! Over the years my recipe has changed. Primarily because I could not always get the "original" ingredients. I am finding myself in this situation now. I have been wanting to make these and share them with you for almost 6 months but I have had one problem: the gyoza wrappers. I can't find them anywhere in our new location. It's so maddening! I can find wonton wrappers and I have resisted this buy for months, until this week. I tried to order the gyoza's online but they want a fortune for shipping…75.00 to ship 12 packages. OUCH! I asked Cory what he wanted for his birthday dinner and this is what he requested. FINE, I will buy the wonton wrappers and make them work…but I am NOT taking a picture of them and sharing on the blog…RIGHT!!! 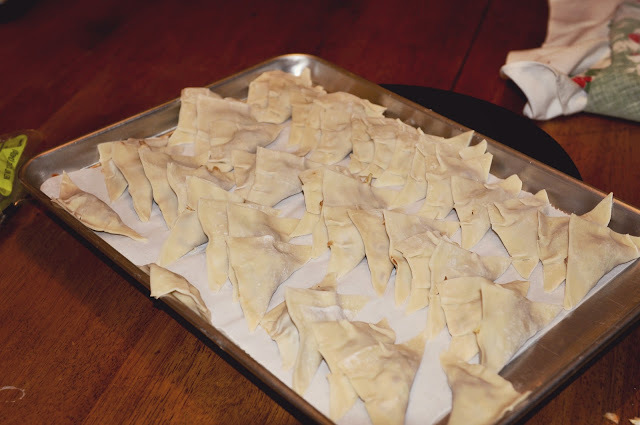 SO, here I am with my wonton wrappers, recipe and pictures. I finally told myself that it's ok to share because maybe others can't find the wrappers too. Honestly, they tasted great and I could hardly tell the difference. To my Japanese friends, please forgive me that I have used another wrapper…but, I could not refuse the request of my hubby for his special meal. 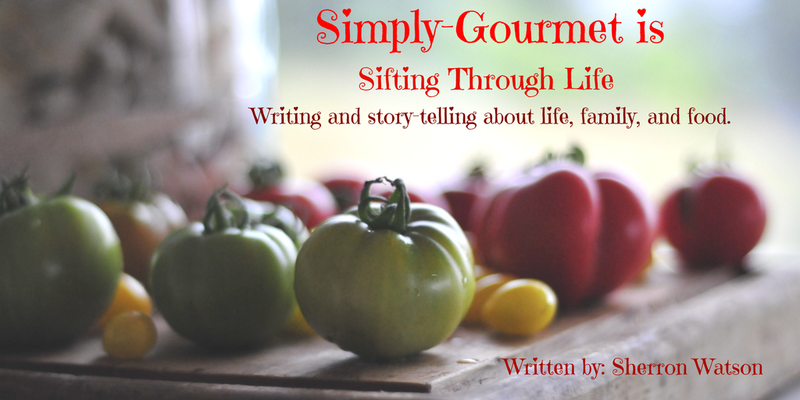 If you would like to see the "real" deal along with beautiful pictures and an original recipe please visit my friend Nami from Just One Cookbook. She is Japanese and has an amazing recipe that you can also check out for Gyoza's. 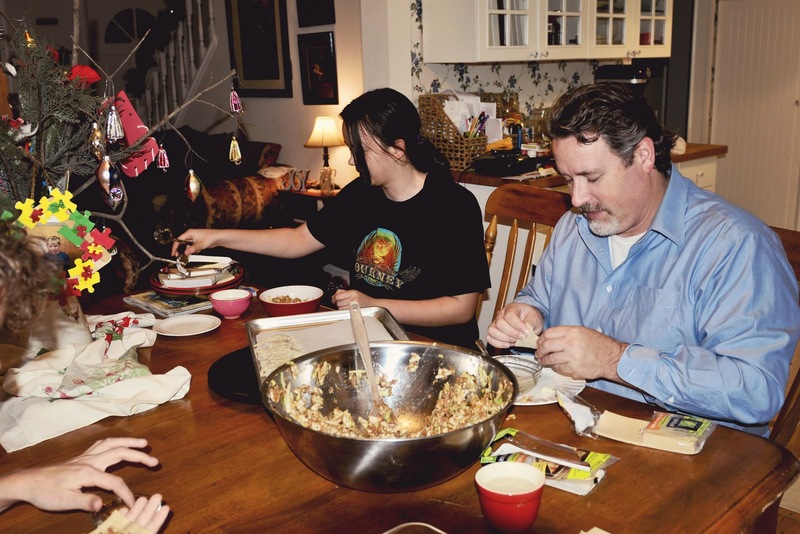 Over the years we have loved having Japanese students living in our home. We love this culture and find ourselves having strong feelings and an abundance of love towards the people, the culture and especially, the food. This always made them smile when I would make gyoza's. This was also the first time that we involved our kids in making the process. I thought that it was about time for them to understand the labor that went into making something that they loved so much. It's kind of like catching your dinner and then having to kill, clean and cook it. Although I did not make them kill the pig for the pork (my neighbor did that). We had a great time. I treasure these times with my kids, especially as I know that their time under our roof is limited. We talked about how, one day, they will look back and remember the times we made gyoza's together and hopefully they will teach their kids and have the same bonding experience. This recipe is a keeper. It's work, but if your involve many hands, it becomes fun and memorable. 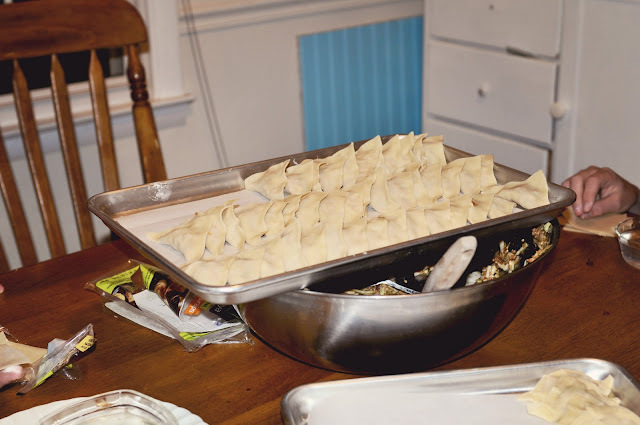 Your Gyoza wrappers should be set out at room temperature for at least an hour before you start to wrap the gyoza's. If they are cold the wrappers have a tendency to break or tear. Just my opinion from over the years of making them. 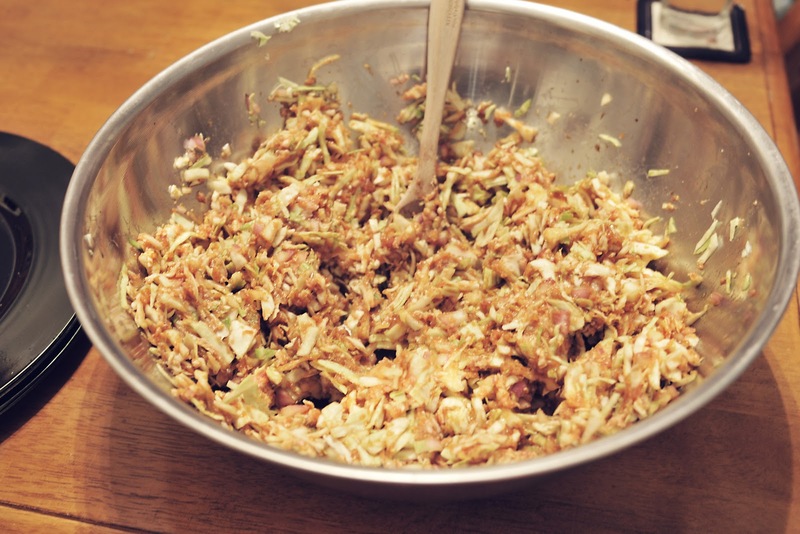 You will want to shred your cabbage very thinly then make sure the pieces are small….do not use a food processor and turn your cabbage into mush. It should be small pieces. See pictures below to gage the size. Finely chop your onion. 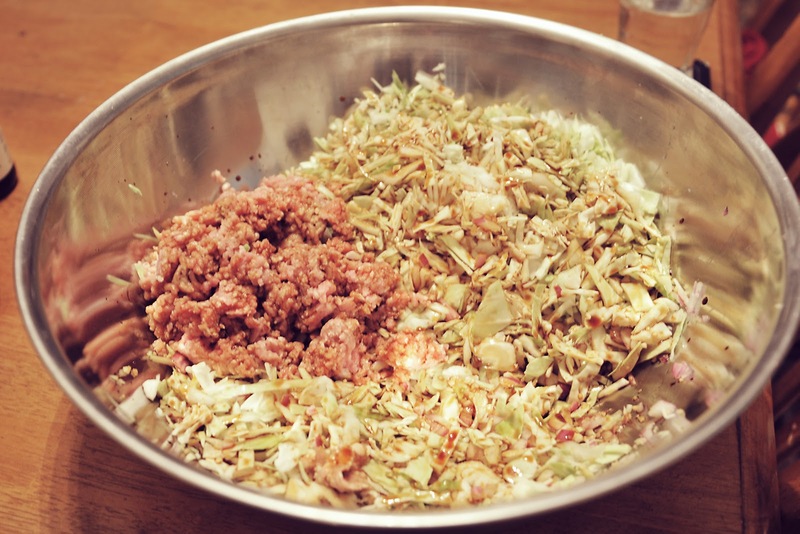 Add the onion, garlic, pork, cabbage, Mirin sauce and soy sauce into one large bowl. NOTE: I do not measure my ingredients for this recipe. The soy sauce is an estimate. You want your mixture to look like it is coated with soy sauce, a light brown in color. MIX all of the ingredients well. I use my hands to do this because I want the pork and cabbage mix to be really combined. This is the pork that my neighbor gave to us. 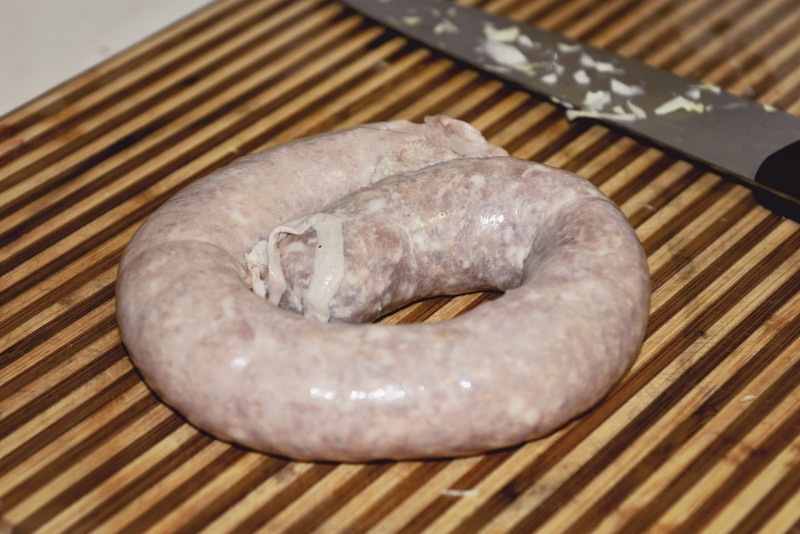 I also use ground pork from the butcher. This really is a team effort. We try to involve as many people as possible when making these morsels of yumminess. I have a large bowl for the meat/cabbage mix and then each person gets a spoon, a small bowl of water and a tray. With your spoon, take a small amount and place in the center of wrapper. Wet the edges all the way around and fold over one side. You can real fancy and put tucks into the edges or simply seal the wrapper. For my immediate family we do not tuck, but for fancy dinners and guest…I tuck! I have cookie sheets lined with parchment paper and start putting our creations into rows. Without the parchment paper they will stick to the metal of the cookie sheet and get gooey. 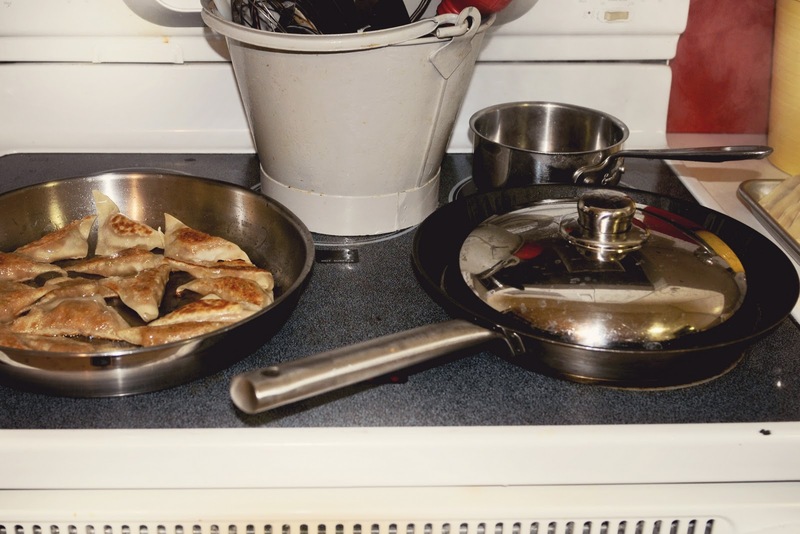 Once your gyoza's are made you can start to cook them. In the past I have had a large covered electric skillet. This is the best way to cook them. You can also steam or boil them. My family does not like them this way so I don't use either of these cooking styles. For this dinner I was forced to use two pans because my electric skillet died and I have not replaced it, plus I forgot about that until I was ready to cook them…LOL Guess whats on my list to buy? In your pan, put a small amount of oil. 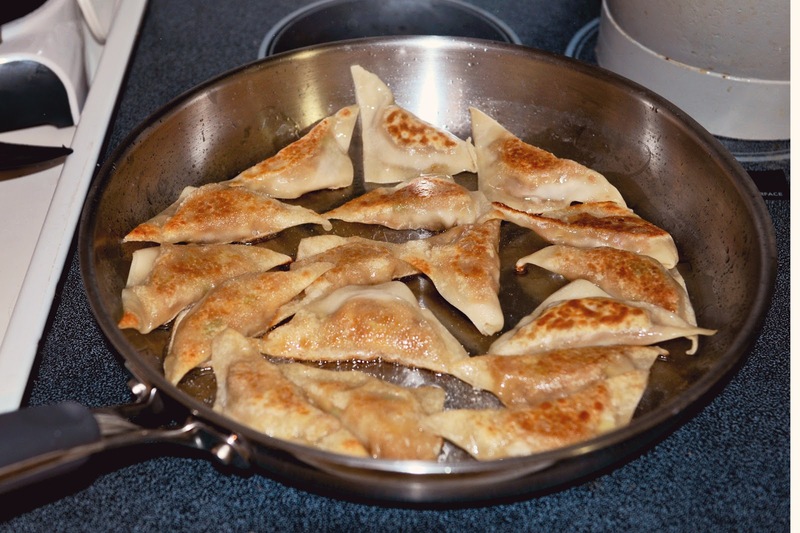 Place your gyoza's and cook about 3 minutes on each side. We do both sides because we like ours a little bit crispy. After both sides are cooked, add 1/4 cup of water to each set cooked and place a lid on top. You want to steam the gyoza's for a few minutes. I usually set my oven to warm, place an oven proof pan inside, and add my batches until I have enough to feed my family. I serve the gyoza's with white rice and the dipping sauce. I like my sauce twangy, so I do a bit more vinegar than most. Your house will smell wonderful, your friends and family will be stuffed, you will be eyeing the leftovers for tomorrows breakfast ( yes, because they don't make it to lunch) and you will already be planning when to make these again. This sounds wonderful. I love Gyoza. My aunt is Japanese, and lives halfway across the country from me, but I have eaten hers before. I just introduced my husband to them on Friday. (We went to a Japanese Steakhouse.) He loved them. I am going to have to try this recipe for Thanksgiving next week... We always have several non-traditional foods for Thanksgiving. Now, I just need to find wrappers.